Early in the Civil War, Gen. Joseph Johnston and his generals in Northern Virginia quarreled with Confederate President Davis in Richmond over the practicality of the president’s defensive war policy. While advocating a defensive posture in Northern Virginia, Davis was also eager to extend Confederate power as far as the Pacific. Taking control of California’s lucrative gold fields would provide a source of revenue for the haughty, new Confederacy. Any westward expansion of slavery would also be strongly supported by the South’s politically powerful large plantation owners. For years, variations of the expansionist dream of slave owners had been a mainstay of dinner conversations in the South’s finest plantations. The objective was to create a confederation in the Western Hemisphere which would include the Southern Slave States, the territories of the southwest United States, possibly Cuba, parts of Central America and northern Mexico. Although it is now largely forgotten, the hazy notion was a subtle part of the ideology driving many of the promoters of secession. The dream held out a promise of an empire based on cotton production and slavery. 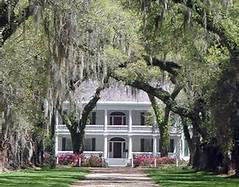 It offered a sparkling alternative to the fraying relationship the South had in the Union. It was a belief held by many of the South’s leaders despite the fact that the institution of slavery was being dismantled in other parts of the world. The idea of Confederate westward expansion was earnestly taken up after the war began. Henry H. Sibley, a Louisiana native and 1838 West Point graduate, was an army major serving with the dragoons in the New Mexico Territory (present states of New Mexico and Arizona). He had served in the Seminole and Mexican wars and was the proud originator of the celebrated Sibley tent. With the onset of the Civil War, he resigned from the U.S. Army and traveled to Richmond to present his proposal for capturing the west. Davis, a large plantation owner himself, was receptive to Sibley’s proposal. In July 1861, Sibley was commissioned a brigadier general and given command of the Confederate Army of New Mexico. He faced a daunting task because Davis had made it clear that he had no arms or munitions to spare. Gen. Sibley would have to run a self-sustaining campaign, depending entirely on local and captured supplies. He would raise troops in Texas, drive northwest from El Paso and subdue the federal forts along the upper Rio Grande River. After capturing Santa Fe, Sibley would strike west, eventually occupying San Francisco. 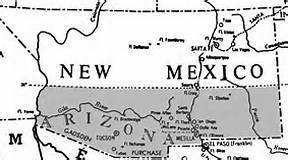 In the New Mexico Territory, local Confederates were already busy, splitting the territory along the east-west 34th parallel (north of present day Phoenix) and establishing the southern portion as the Confederate Territory of Arizona. While Sibley was returning to Texas, John R. Baylor, a brand new lieutenant colonel, captured Ft. Bliss at El Paso and moved north. In August 1861, he proclaimed Mesilla (in present New Mexico) as the capital of the Confederate territory and became its military governor. Gen. Sibley arrived in El Paso in mid-December 1861 with the three mounted regiments he had raised. In January 1862, he began his campaign to take control of the Rio Grande. Sibley’s forces captured federal positions at Albuquerque and Santa Fe. In March, at Glorieta Pass east of Santa Fe, his luck ran out. A force of Union volunteers from Colorado led by a former preacher got behind Sibley’s lines and captured his supply train. The Confederates lost 85 wagons along with 600 horses and pack mules. Faced with an irreplaceable loss of supplies, Sibley was forced into a devastating retreat that halted only when the tattered survivors of his expedition staggered back into Texas. As Sibley began moving north, Capt. Sherod Hunter and about 100 Arizona Rangers were ordered to secure Tucson, arriving in February 1862. Hunter’s troops hoisted the Rebel flag at the Presidio Plaza amid some cheering from pro- secession residents. Hunter’s force patrolled the roads leading west, harassing and delaying the Union column moving in from California. 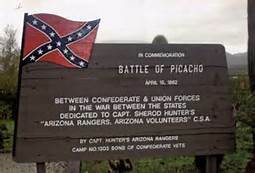 They skirmished with Union patrols at Stanwix Station on the Gila River and Picacho Peak north of Tucson, thereby fighting the westernmost land engagements of the war. With no hope of reinforcements, Hunter was forced to evacuate Tucson in May 1862, retiring to Mesilla. By July, any hope of Confederate western conquest disappeared as all of the short-lived Confederate Territory of Arizona was cleared of Rebel forces. Although it failed, the Confederate campaign had an effect on the geographic shape of future states. In February 1863, the U.S. Congress and President Lincoln split the New Mexico Territory into two parts, creating a new Arizona Territory with a border running north-south instead of east-west. The wartime line designated by Lincoln remains as the current boundary line of the states of Arizona and New Mexico.